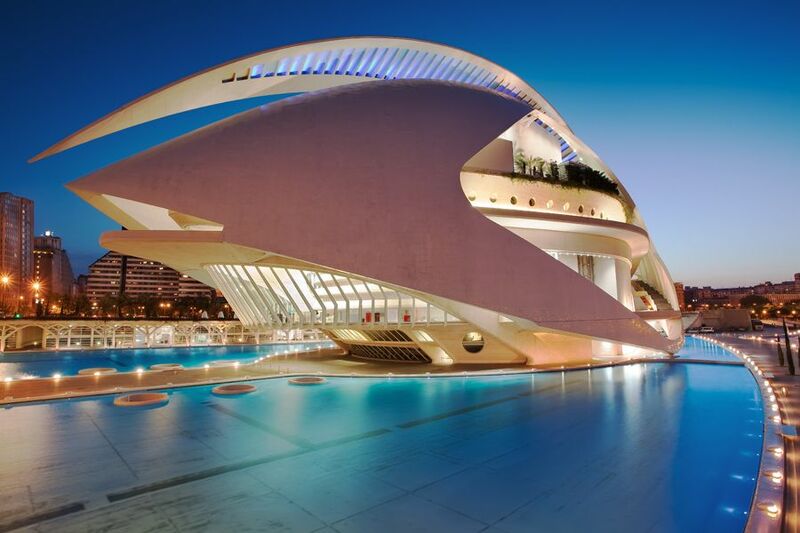 Inspiration came from the architect Santiago Calatrava. I was introduced to this architect through a collaborative piece with a glass artist on my master’s degree. I immediately fell in love with his clean, bright structures, which are actually inspired by the human anatomy and birds. For my Calatrava costume design, I took the curves and linear details of the rear elevation of The Queen Sofía Palace of the Arts opera house in Valencia, Spain. Then translated these lines as costume panels, surface pleating and exterior structure (hip fins). I utilised similar colours from this structure in my design; blue hues, grey and black. I used reflective tape on the hip fins to reflect the bright whiteness of the building when in sunlight and to add another dimension to the whole costume. Other design influences came from 18th and 19th century costume, using a corset structure to emphasise the curving rigidity of the building. The partlet is an extension of the corset to help balance the large hip fins. I had hoped to create a pleated structural skirt, but time was not on my side. I am trying to start up my costume making business using only vegan friendly fabrics and findings (with help from the Vegan Society), so for this entry I tried to only use natural fabrics (cotton) or synthetic materials (reflective tape backed with cotton). I initially began designing and cutting on a 19th century silhouette mannequin (with an incorporated bustle) but I couldn’t figure out how to create a laced corset with this bustle extension, so I altered it to fit a standard mannequin and gain shape with the hip fins. I usually draw up initial designs to get my ideas flowing, but when it comes to the construction I often alter it. This time I tried to stick to the design as much as I could. In past projects I have been guilty of adding too much surface pattern/colour/texture, but to reflect the clean surface of Calatrava’s architecture, I limited my textile applications to fabric paint on the partlet and tie-dye on the hip frills. This helped to break up the flatness of the costume. On reflection, I could have used a shiny surfaced fabric to achieve a colour variation. Other resources I used were the skills I gained at university, such as cutting on the stand and flat pattern drafting. This was my first entry! Entering has given me a purpose, something to keep my mind active and make me feel useful. Since I graduated in 2017, it has been daunting and impossible to gain industry experience in costume due to my ‘limited experience’. When I joined Foundations Revealed, I felt like I was ‘home’. The support in the Facebook group and through the videos has made me feel like I can enter. It doesn’t matter what your skill level is; if you love to create, can creatively problem solve or just love costume then enter! You won’t be ‘judged’ or criticised, just encouraged. This is a beautiful, complex work of art. I entered in "experienced" this year, but I would not be able to do this and you have done it amazingly. Well done! Heck yes team Calatrava! I love out so very different our corsets are, inspired by an architect with a pretty distinct style. The blue color accent is perfect — you always see his designs photographed with the blue sky and or water to accent the white. ?? I adore how you used pleats to interpret parts of the building. This is such an evocative design! This is some marvellous engineering! I bet those reflective pleats do amazing things under different sorts of light. Also: I'm in love with those little tails! I'm always drawn to strong shapes and lines and your design has it all for me. Especially the back view has such a striking silhouette and I agree with Damaris that the pattern matching on the back is awesome! This is a lovely costume! I'm not familiar with the architect who inspired you but I like how you achieved those clean, yet visually, interesting lines. Fantastic work! I love all the layers and details, and the hip fins especially. Just beautiful in every way! Those hip fins are amazing. I love the way you used color to emphasize the bold, clean lines. Best of success with your business venture! You are already a master and so very creative! Lovely work! Your inspiration is translated so well in this piece through the stripes, the shades of blue, the curves. I think it's brilliant that you picked an architect who in turn is inspired by human anatomy and birds. The linear detaisl in the rear elevation of the Queen Sofia Palace opera house feels like looking at the back of a bird with it's wings sleekly folded down. You translated this well with the pleating and tail in the back which are reminiscent of bird feathers. Your corset is an incredible shape. Those hip fins and the tail are so dramatic. It's a really strong interpretation and great use of colour. I'm a magpie and reading how you had to reign it in to reflect the clean lines is something I completely relate to so I think you've achieved a great balance in honour of your building. The pleated hip fins and the back view are what struck me immediately. It has strong lines and you have used many techniques in the whole piece. Great work. I am speechless! To me corsetry is so similar to architecture because of its ability to create new shapes and to explore space and it is really what you have done here. The patternmaking is impressive and the construction so neat! I particularly love the reflective fabric and the pattern matched stripes at the back of the capelet. Congratulations on your first entry! I really like the little bolero effect! Well done! Wow, I would never be able to do what you did here! Beautiful design! And I like the paint and the reflective tape! So thoughtful, this design, and such fantastic sculptural elements. I cannot help but imagine wearing this and feeling like I could take on the world! Well done! this is so striking! The lines are so strong - I love it! I really like how you've made it into a corset dress, too (or at least it seems that way based on the length on the mannequin! ), so this is pretty much it's own outfit, so the focus is entirely on the glorious hip fins and the sharp yet curving lines that you've created here! I love the little tails in the back -- I would love to see a video of someone wearing this and moving -- I think that the combination of the wind/movement making the tails rustle while the light reflected off the hip fins would be glorious! This is really interesting! The more I look, the more I see! I love the lines of this design! The fins look so delicate and structured at the same time. The jacket is the perfect complement.